Wizards of the Coast is launching a new multiplatform storyline this summer titled Tyranny of Dragons. 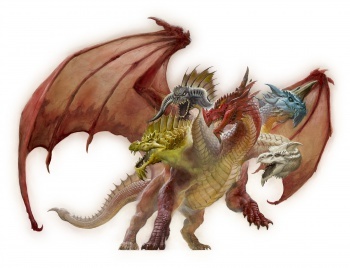 In celebration of the 40th anniversary of Dungeons & Dragons, Wizards of the Coast unveiled Tyranny of Dragons, a new storyline that will span multiple platforms. Set to start this summer, Tyranny of Dragons sees the Cult of the Dragon seek to free Tiamat, the queen of evil dragons, from the Nine Hells and bring her into the Forgotten Realms. Adventurers will be tasked with putting a stop to the cult and ultimately face off against Tiamat herself. The story will be experienced through video games, mobile games, in-store play at local hobby shops, and other platforms as well. While details are presently scant, Wizards of the Coast does mention Icewind Dale, the Silver Marshes, Neverwinter, and Waterdeep in its official reveal article. The odds of a new sequel in the Icewind Dale video game series are slim, but I strongly suspect we'll see Tyranny of Dragons in the Neverwinter MMORPG. A new season of Encounters focused on this storyline is almost a guarantee, as well as a series of adventure modules for D&D Next, but Wizards has not yet confirmed any of this.